Craig Leipold saw the word "ufa"
he had no intention of honoring. 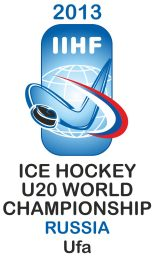 It's almost World Juniors time again, with the eagerly anticipated annual tournament kicking off next week in Russia. Here's an advanced scouting report on the ten teams competing to take home the gold. The good: Top prospect Seth Jones is the son of former NBA star Popeye Jones, but chose to pursue a career in hockey instead in an attempt to maximize the percentage of his career he can lose to lockouts. The bad: Have had to waste valuable training camp time repeatedly ejecting undercover Russian spy Alex Galchenyuk and his ridiculous cover story about being born in Wisconsin. The good: Are apparently the defending champion, according to North American hockey fans who just Wikipedia'd last year's tournament because they stop paying attention once their team is out. The bad: Goaltender Oscar Dansk was a high pick in the 2012 NHL draft, but it was by Columbus so it's possible he's never actually been on skates before. The good: Are said to have their most athletically gifted team ever. The bad: That means that this year when somebody yells "Oh no, Team Canada is taking a slapshot, everybody run! ", some of the players will be physically capable of running. The good: The national program continues to produce excellent players. The bad: Many of them are unavailable for this tournament because, following long-established Slovakian law, the country's five best players each year are merged Voltron-style to create a new version of Zdeno Chara. The good: The team has been described as being so focused and determined that they're only planning to execute a spinning double-backflip into the end glass after their 14th goal against Switzerland instead of the usual triple-backflip. The bad: Are hosting the tournament, meaning they'll play each game in front of thousands of local fans who spend the entire game muttering "Wait, isn't this that tournament that only people in Canada actually care about?" The good: The team is led by a baby-faced star who hass invigorated everyone with his youthful enthusiasm. The bad: At some point tournament officials will realize it's a locked out Teemu Selanne and tell him to go home. The good: Forward Toms Andersons is extremely difficult to contain, mainly because he's actually several guys named Tom Anderson. The bad: Basically start the tournament one win behind everyone else in their group, since they're the only team that doesn't get a chance to play Latvia. The good: Their opening game against Canada takes place at 4:30 a.m. ET, so their 19-0 loss will probably only be seen by maybe seven or eight million people. The bad: For some reason, have gone with a roster made up almost entirely of Germans. The good: Scouts are once again describing them as "the fastest team in the entire tournament". The bad: Scouts are once again immediately adding "… at getting through airport security, since they haven't set off a metal detector since 2005". The good: Will feature six returning players from last year's bronze medal squad, since that's how many managed to swim back to shore after being placed on an ice floe by the Canadian government for failing to finish first. The bad: Will have to beat Russia on their home ice to win gold, which will probably take some of the novelty off of doing it again at the 2014 Olympics. Lasting legacy: Taught us all that your dreams really can come true, assuming you are the 1988 Toronto Maple Leafs and your dream is to make the Norris Division playoffs with 52 points. 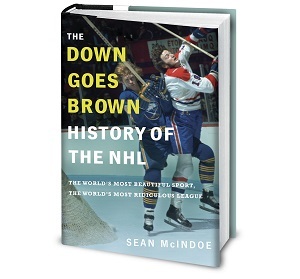 From The Not-So-Original Six: A look back at the NHL’s first expansion teams, one of 24 chapters of brand new material available exclusively in The Best of Down Goes Brown. You forgot to add #BOOM to the last line. Some big lawls towards the end. Good show. As a german, i cried a little. As a duck fan, the Selanne one was golden. One of your best posts in the last while. but "For some reason, have gone with a roster made up almost entirely of Germans." The Selanne one was awesome, but it also makes me mad that we're not watching him play NHL hockey right now, dammit Bettman you $%^*&&@! "following long-established Slovakian law, the country's five best players each year are merged Voltron-style to create a new version of Zdeno Chara." Habs fan here. Happy about our russian spy from Wisconsin (he can even speak English !?! ), hoping to get the baby faced Finn that's not a locked out Duck. the captions are always good but i really enjoyed this one. Hockey humour and a Voltron reference is enought to put me in overload. So awesome. Serious prediction: Canada chokes due to ridiculous amounts of pressure and hole-filled goaltending. USA doesn't make a medal round due to them being so focused on the USA-CANADA game, they overlook the others like they did the last two years. Russia will fail to live up to expectations of the home crowd and crumble. Another European country (Sweden or Finland?) will sneak in and win it. Probably due to a goalie stealing it. Best caption in a long time. Likely best joke of the whole post. Bravo. Great post, though the stab on Switzerland was uncalled for! It took Russia 5 rounds of a SO to beat CH this year.